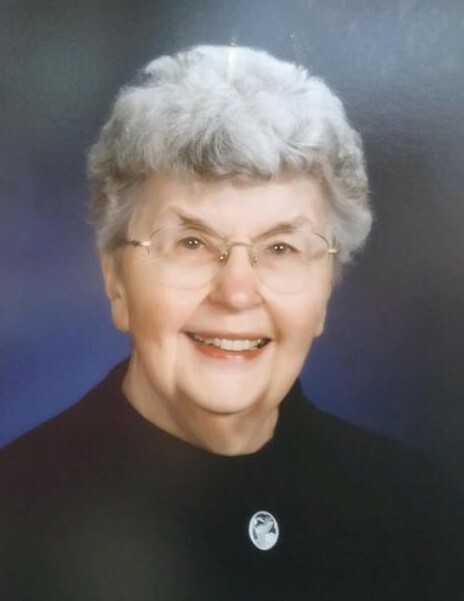 Obituary for Wilma Louise (Thompson) Calloway | Stone Funeral Home, Inc.
Wilma Louise Calloway, longtime resident of Pellston, passed away peacefully on Saturday, April 13, 2019, at Bay Bluffs Medical Care Facility in Harbor Springs. Wilma was born on August 1, 1927, near Cumberland, Wisconsin, the second of six children, to Otto and Sophia Thompson. She was raised on the family dairy farm during the depression years and learned the value of hard work and strong family ties. Her Norwegian heritage played a large role in her upbringing and brought her a great deal of pride throughout her life. Wilma began her education in a one-room schoolhouse, walking a mile to school (uphill both ways! ), eventually graduating from Cumberland High School and going on to Superior Teachers College in Superior, Wis., where she received her Teaching Certificate in 1948. As she was preparing to receive her certificate, she heard about a school principal from Alaska who was on campus recruiting teachers. On a dare, she and her friend, Pearl Hedland, met with him, and shockingly, both ended up accepting positions in Haines, Alaska, which was still a U.S. territory. In 1948, for a couple Wisconsin farm girls who had never been more than 100 miles from home, Alaska may as well have been the moon, but off they went, by train and ship, and had the adventure of their lives. Wilma met her husband Danny A. (Dan) in Haines. He was stationed there with the Civil Aeronautics Administration, the forerunner of today’s Federal Aviation Administration. After they were married, they stayed in Haines until 1952 when Dan was transferred to the airport in Jamestown, N. Dak., and then to Pellston, Mich., where they made their permanent home. She taught school in Pellston as a substitute in all the grades and as a permanent sixth-grade teacher. She loved to read and gave her students a strong grounding in the “three Rs.” You didn’t get out of Mrs. Calloway’s class without knowing your multiplication tables backwards and forwards! And you better believe you behaved yourself! For many years, she was the teacher of the Petoskey Co-operative Children‘s Nursery School, and nobody could have enjoyed a job more. She dispensed love, fun and generous hugs to a generation of children, as well as common sense childrearing advice and friendship to their working mothers. Wilma loved to travel and never lost her zest for adventure. She returned to Alaska several times and also travelled to Norway. She hiked on the Appalachian Trail and canoed the Sturgeon River. She and Dan enjoyed visiting Nova Scotia and took many camping trips through New England. She delighted in music and played the saxophone in the summer community bands in Mackinaw City and Harbor Springs. She even played with the Pellston High School Jazz Band, which practiced before the start of the school day. She bought each of her Grandchildren the band instrument of their choice and encouraged them to learn to play, even relishing the sour notes. Wilma is survived by her children, Lon (Lisa) Calloway of Indian River, Tim (Niki) Calloway of Harbor Springs, and Kelly (John) Powell of Fannettsburg, Pa.; six grandchildren, Jessica (Peter) Jones, Danny (Crystal) and Adam (Tomás Castillo) Calloway, Jessica Powell, Tim (Jenn) Powell, and Jamie (Nicholas) Reeder; eight great-grandchildren, Harvey Calloway, Katie and Brian Reeder, Kristie, J.D., and Karlee Powell, and Josh and Ryan Reeder; brother Edward (Marla) Thompson of Cameron, Wis., and sister Lois (Gerry) Anderson of Barron, Wis.; and many nieces and nephews. Preceding her in death were her husband Dan, parents Otto and Sophia Thompson, sister Carol Grace Cormany, brothers Duane Thompson and Floyd Thompson, nieces Jerri Lynn Thompson and Trudy Thompson Yoho, and great niece Sarah Thompson. Memorial service celebrating her life will take place Saturday, April 27, at the New Hope United Methodist Church, PO Box 72, 4516 US 31 N, Levering, Mich. Visitation will be at 10:00 a.m. with the service to follow at 11:00 a.m. The family would like to suggest memorial contributions can be made to New Hope United Methodist Church. Envelopes for that purpose will be provided at the church. There's still time to send flowers to the Visitation at the New Hope United Methodist Church from 10:00 AM to 11:00 AM on April 27, 2019.